Can You Erase My Double Chin? Some see Zacarias Moussaoui as an unscrupulous terrorist responsible for thousands of deaths on Sept. 11, 2001. Others view him as a pathetic hanger-on with delusions of grandeur. Dana Verkouteren sees him as a complex subject of art. 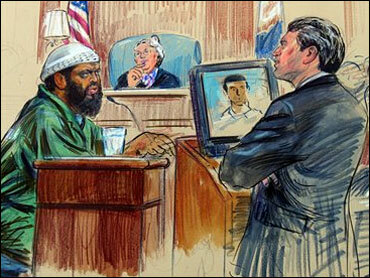 "All of his personalities are coming out," says Verkouteren, who has been drawing the al Qaeda conspirator's trial at the U.S. District Court in Alexandria, Va. "When he's relaxed, he strokes his beard. He has very soft lines for eyes, but he scrunches them down a lot when he's upset or when he wants to make his lawyer think he doesn't like him." Body language is key to Verkouteren, who's been sketching trials for more than 20 years. Whether it's a wild gesture or a calm stare, she decides which "personality" the public will see. Along with a handful of other courtroom artists in federal trials where cameras are banned, Verkouteren provides the proceeding's only visual evidence. She is among a select and dwindling group – one of just three artists who work regularly in the Washington, D.C. area. Verkouteren, who currently works for The Associated Press, says the industry has downsized as television stations and news publications began sharing courtroom artists to save money. These days, only a handful of artists make a living doing courtroom renderings. Marilyn Church, who has sketched everyone from Son of Sam to Martha Stewart for The New York Times and ABC News, estimates the average courtroom artist pulls in $350 per day. However, that amount can grow if you sell your sketches to multiple news outlets. Another way is to sell them to trial attorneys with deep pockets. Many of the artists' subjects — often high-powered lawyers or celebrity defendants — purchase sketches as mementos. The higher the case's profile, the higher the sketch's price tag. One of Church's 1980 sketches of John Lennon's assassin Mark David Chapman is selling for $9,500. While some courtroom figures try to purchase the artists' final product, others aim to influence it. It is not uncommon for witnesses and lawyers to make artistic appeals. Some request more hair; others complain about double chins. Church says that during the first World Trade Center bombing trial, a defense lawyer complained that his client was being portrayed as an angry terrorist. "He looked pretty ferocious to me," Church remembers. "But I guess the testimony doesn't make you look kindly on them either." Vicki Behringer, a Sacramento, Calif.-based artist who has covered the Michael Jackson, Scott Peterson and Unabomber trials, maintains a more practical response to charges of biased renderings: People don't smile in the courtroom. "If you've been crying or your life's on the line or you're an attorney and you've been working day and night," she says, "you might not look so good." Unflattering looks may also be a product of a sketch artist's frantic pace. Depending on the deadline (TV stations demand sketches every hour or so) and a trial's length (an arraignment can take just 60 seconds), courtroom artists speed-sketch. If a key witness makes a fleeting appearance, artists must get creative: Verkouteren says she has used the courtroom bathroom as a "studio" to finish some sketches during the Moussaoui trial. Still, American courtroom artists may have it easy compared to their British counterparts: U.K. law prohibits drawing in the courtroom, so artists have to sketch from memory. British artist Elizabeth Cook has sketched courtroom figures as diverse as Elton John, General Pinochet and the Spice Girls. She says she studies a subject's forehead length, distance between the nose and top lip and jaw width before she goes off to sketch. "It's a process that only takes seconds," she says. "I carry that visual image in my mind and try to get drawing as quickly as possible." For courtroom artists, the only thing tighter than the deadlines is the work conditions. Artists sketch in a space about the size of a movie theater seat and usually sit right behind the defendant, straining to catch meaningful expressions. "You're just hoping he turns sideways and talks to his lawyer," Church says. Courtroom artists are a hot commodity in states that don't allow cameras (currently seven don't, including New York) as well as all federal trials at which photography is forbidden. Today's artists can thank the overbearing press coverage during the 1937 trial of Charles Lindbergh's kidnapped son — that's why cameras originally were banned from courtrooms. Church and Behringer concede that television and photography may allow for more openness, but they also point out that lawyers are more prone to play to the camera. They also argue that trial coverage would be at the mercy of sound bite-hungry network editors — not charcoal pencils and watercolors. "It protects the defendants more," says Church, who this month published "The Art Of Justice," a compilation of more than 100 of her courtroom sketches. Sitting and sketching nonstop in a trial can be draining. Verkouteren says she loves the gig but needs the balance of her other art, which is drawing caricatures. Church calls the competition in New York, which has evolved into more of a freelancer's market, a "feeding frenzy" and only goes to trials to which she's assigned. Behringer says the job can take a toll emotionally. The California artist says that early in her career, she sketched a particularly wrenching murder trial and found herself tearing up. But after the Scott Peterson trial, Behringer realized her emotions had taken a back seat to her art. "The reporters were crying, Laci's mom was so emotional and yelling at Scott. … the jurors were crying," she recalls. "I think I was the only one in the courtroom not crying."